Filters are used when you what to limit the results that are shown, and can be used either for viewing or downloading. You can create filters by clicking the Results button on the left menu and then the Manage Filters link option. There are two types of filters Question Filters and Date Filters. 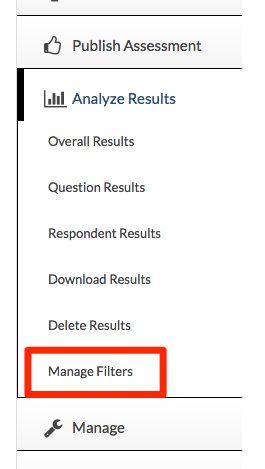 Filters are applied to the results summary pages to exclude specific results from the summary list. This filters respondent answers depending on the answer for a particular question. For example a login question is "Gender", and the possible answers are "Male" or "Female", questions filters are useful for filtering out all of the males or females. As the name suggests, this filters out respondent answers that have been taken outside of a specified date range.